In the given blog, find out different aspects of web design and development that needs to be follow if your website needs a revamp. A website is a great way of adding in value and services to your customers. It helps in providing complete information about what your company is all about online. Web design helps in creating websites in a collaborative way, encompassing several different rollouts, including web page layout, content production and graphic design. Web development and Web design are often understood to be the same, but they are two different means of Web. Web design is technically a broader category of Web development. How are the two aspects different from each other? 1. Web Design- It refers to both the aesthetic amount of the website and it’s usability. Design programs such as, Adope Photoshop is used to create layout. 1. Balance -Creating a balanced layout, by referring to heavy, being dark and large colors, to light, being small and lighter colors. Having used the proper proportion of it, is what makes the layout achieve balance. 2. Contrast -With web design, you get to get on hand with contrast layouts. Designers look at contrasting size, texture and shapes to get a proper picture to draw the attention of certain sections of the website. 3. Emphasis -It basically is a designed principle of certain important elements of the website layout. Website is the most important component for your company’s marketing plan. 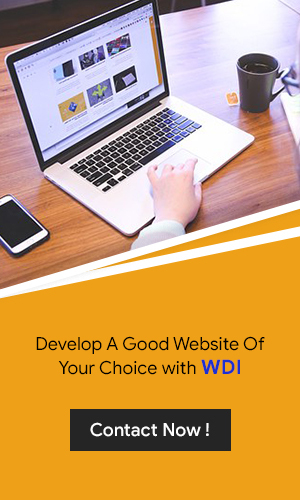 WDI is a trusted web development company in india, with professionals having enough knowledge and skills to help form and make a definite piece out of a simple website. The most important part of the website is having formal navigation. Working with right tools and technologies, with reasonable budget and time, they help in securing and providing a good looking website. WDI, works with collaboration of their thoughts and the customers wants. Use of UI for functionality, with presentable displays that best satisfies the need of the company. A basic process of conceptualizing, planning and building a collection of electronic files into a definite layout of colors, text styles, graphics and images. The team of experts work with the latest technologies, having enough experience in creating high- end software, websites. Here is the list of top web development companies, for your project. They provide with Web design and development services, to be able to convert your idea, into one existing and functional website that not only sums up your expectations but as well develops your needed site. Website Developers India proves to develop high-performance websites for the betterment of your company.